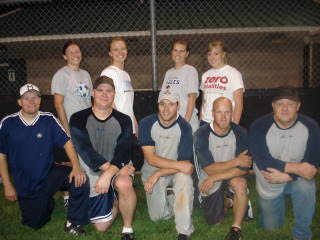 Okay, so after blogging about how I can usually get on base I played horribly the night of our final playoffs. We were playing for the top three spots of our league, which meant we could play up to three games on Tuesday night if we kept winning. Well, we kept winning but no thanks to me. We ended up losing the last game in the last inning by one run. It was kind of a bummer but only having 9 players throughout play-offs I felt our team did awesome (you are allowed 10 people on the field). I really didn't help out much, but it was still fun to play. I am glad I had the chance! Bart, of course did a great job. He is quite the athlete. And no, his shirt was not two-toned gray. That is three games worth of sweat and a little bit of rain.